Andrew Jarrett, former Executive Coordinator of the Kootenay Boundary Community Service Co-op, and one of the key founding directors of the UCCC, was honoured for his outstanding contributions to the co-op sector at the BC Co-op Association’s Annual General Meeting on June 13 in Vancouver. In 2001 Andrew Jarrett was a participant in discussions with community service agencies in the Kootenay Boundary as they addressed challenges of imminent funding reductions and tendering of government contracts under the BC Bid system. The community leaders sought a strategy that would facilitate co-operation among organizations and decided to pursue the formation of a co-operative. Andrew took strong leadership of this initiative and was instrumental in obtaining initial funding to resource the formation of the Kootenay Boundary Community Services Co-operative. Shortly thereafter, Agriculture Canada provided three-year funding to the co-operative, under the “Co-operative Development Initiative” and Andrew was hired as Executive Coordinator. Andrew continued as Executive Coordinator until his retirement in June 2013. During these years his leadership and vision provided impetus to the evolvement of the co-operative. 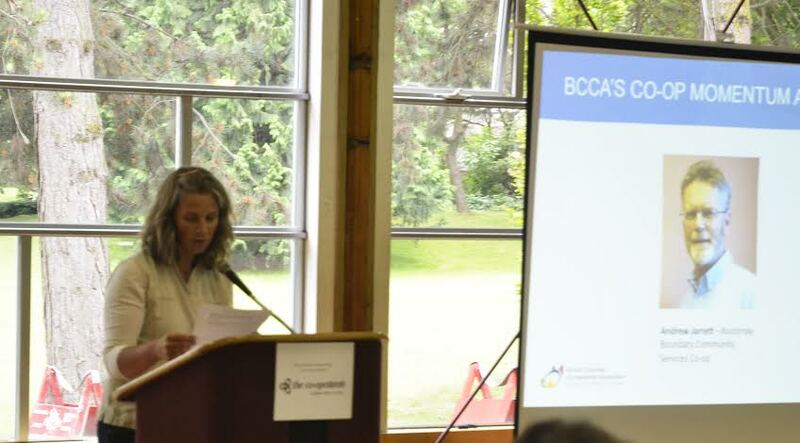 As a result of the growing strength of the KBCSC, in 2008 a partnership was formed between the Co-op and the Columbia Basin Trust to strengthen community service agencies in the West Kootenay and throughout the Basin. This unique partnership was possible in large part due to Andrew’s ability to draw together an impressive organization capable of providing leadership to community social service agencies. Andrew has also been actively involved in regional and provincial co-operative organizations. As one of the founding board members of the Upper Columbia Co-operative Council, Andrew has been instrumental in facilitating collaboration and resource sharing among our regional co-ops and credit unions. With a keen eye for both systems and detail, Andrew’s work on the Council Board, and as its Treasurer, have built the strong foundation for his colleagues and successors to further co-op development in the region. His one-on-one work as a development consultant with local co-ops, and his annual tours of Co-ops 101 sessions throughout the region, have furthered his significant impact on the regional co-op sector. Andrew served on the board and currently chairs Realize Co-operative, a co-op formed to build the capacity of non-profits across the province. on your numerous co-operative projects and initiatives!